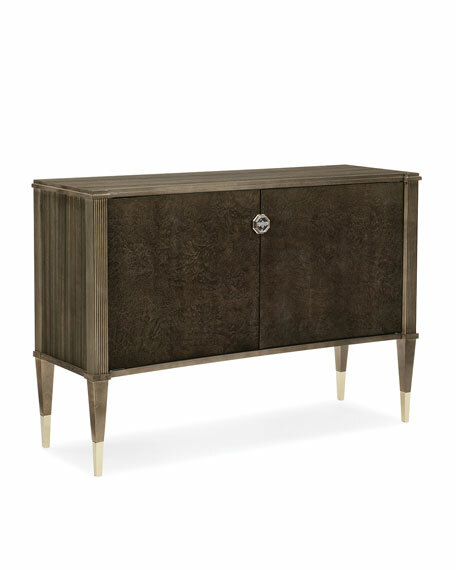 Mixed woods create "A Little Buzz" in this tailored cabinet with a subtly concave front. Paldeo wood wraps the top and sides of this piece, while the doors showcase the beauty of highly figured burlall brought together in a soft Sepia finish that lets the woods shine. 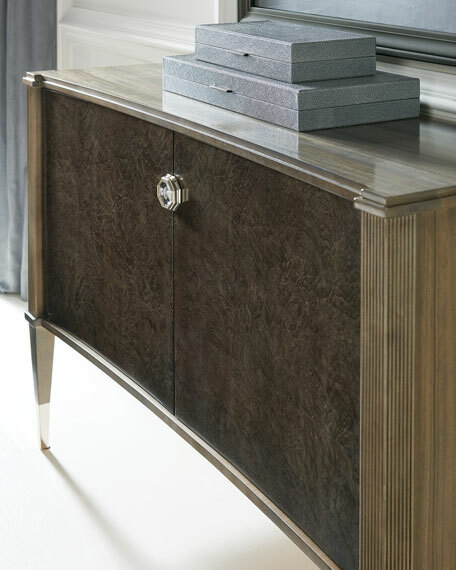 This piece has beautifully reeded edging that leads your eye to the streamlined tapered legs with Whisper of Gold ferrules. In the center of the octagonal Whisper of Gold hardware is a three-dimensional impression of a bee, crafted very much in the style of a noted French crystal artists. Storage inside the case includes adjustable shelves. This piece should be put on full display in an entryway, living room or formal dining room. Handcrafted cabinet with bee hardware. Birch, quartered paldao, and madrona burl. Overall, 50.3"W x 17"D x 35"T.